Increase in market risk level? Is it time to sell stocks? Sometimes people feel that stocks have moved into a negative trend, although in practice there has been no substantial change in the price of most of them. So here’s the S&P500 in the last 25 years. 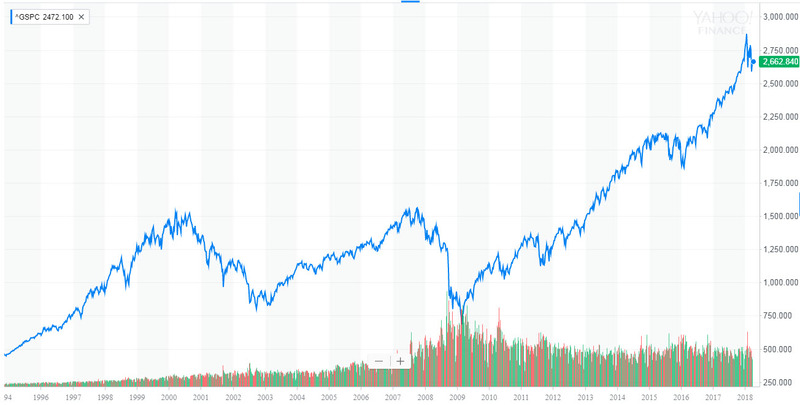 I see two peaks and two major collapses – in 2000 and 2008, and since then we in continues rally with only a few minor drops along the way, including the one that we see in recent weeks. In other words, there was no dramatic drop here. Still, it seems that something has changed recently in the stock market atmosphere. In recent years, we have seen more and more investors claiming that companies’ financial results have lost their impact on the behavior of their shares. 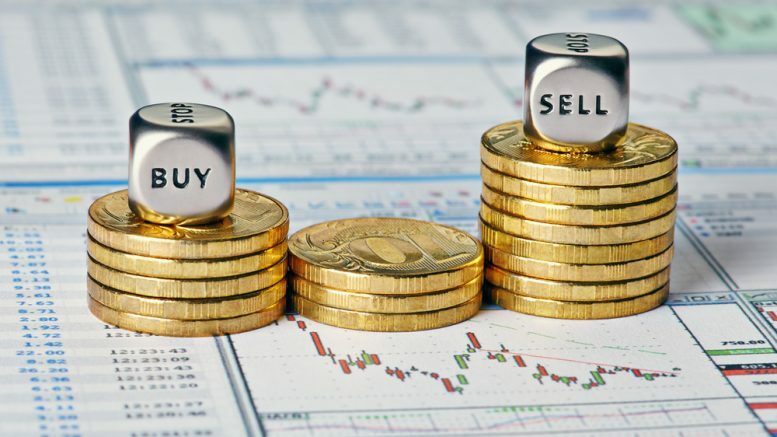 Thus, instead of reading financial statements, many investors chose stocks based on other elements such as stories of future growth, mere innovation without the possibility of positive profitability in the foreseeable future, momentum, speculations, short-living trends, etc. This has led companies such as Amazon, Tesla Motors, and many others to trade at fairly high multiples relative to their financial results. David Einhorn, one of the big value investors, (unfortunately) bought a short position on these shares and his fund lost a lot of its value in the past year. Einhorn explained the loss by saying that “value investing may be dead”. Einhorn was, of course, cynical. Such a situation is irrational since in an efficient market the company’s value (or share price) is derived from its future cash flows. Well, it’s true that it is difficult to predict growth, profitability and future cash flows. Unexpected things sometimes happen. Still, to say that valuing companies according to their financial statements do not work is wrong. Of course, there are periods when stocks are traded too expensive or cheaply, but sooner or later they will return to their fair price. In other words, “Fundamentals do not matter until they do”. It seems as though that this economic logic is beginning to return to stock prices, and because of this, there has been a certain negative trend in recent weeks. Trump or the Fed – who drive stock prices? President Trump repeatedly proves to us that he is not going to have a peaceful term. On the contrary, he is making revolutionary moves from time to time. Some are smart and some are not, but in any case, this contributes to increased volatility in the markets. However, in my opinion, the main reason for the increase in investors’ fears is not a trade war between the US and China (a war that I do not anticipate will occur at a high level, if at all). The main concern is the consequences of the termination of quantitative easing (QE) program and the beginning of the quantitative tightening (QT). Fed Chairman Jerome Powell said in his last speech that the US economy looks good, the labor market is close to full employment, and the slow rise in workers’ wages indicates that the economy is not overheating, so the Fed plans to continue with its interest rate hikes (3 or 4 increases this year) and at the same time accelerate the sale of the $4 trillion bonds accumulated in its balance sheet since 2008. In fact, the reduction plan was announced on September 2017, but it has only recently been implemented. For those who have not yet understood, this is a reversal of what the Fed has done in the last 9 years – instead of buying government bonds in the market, keeping the interest rate low and providing banks with liquidity to lend to their customers, the Fed will now sell back the bonds to the banks. In other words, stopping the flow of cheap money into companies and individuals and releasing the artificial barrier on US bond yields. 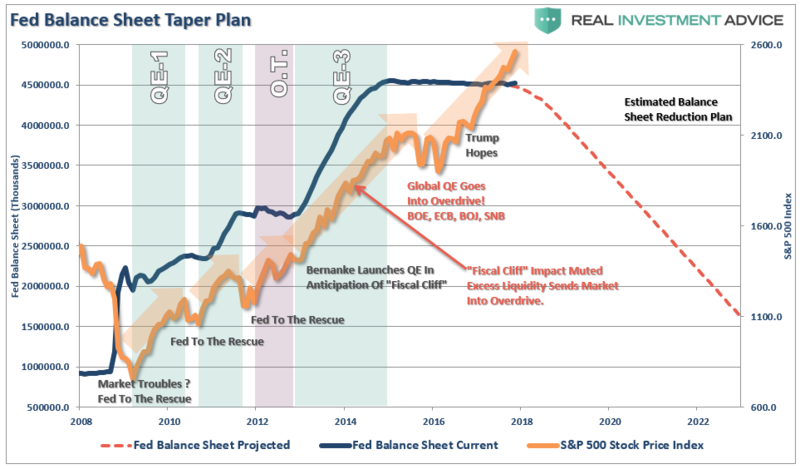 At the moment, the Fed’s balance sheet is reduced by about $30 billion a month, but later on, the pace of sales will increase to over $50 billion a month. It is easy to see the strong support of the US and other central banks’ bond purchases program in the S&P500. Now that the wheel has turned around in the US and the end of the era of cheap financing and market support by the Feds is over, it’s understood why investors are afraid. In addition, as noted, many companies took advantage of this window of opportunity to leverage themselves too high, and now some of them will find it harder to recycle their debts. This also makes investors nervous. The US Treasury bond reduction program is nothing compared to what is expected to happen when the European central bank’s (ECB) bond purchase program ends. Why? Because the US government bonds are a decent investment right now, especially in view of the interest rate hikes. Contrary, the ECB is almost a single player in the bond market, and there is no secondary market that will be interested in European government or corporate bonds when the bank stops buying. The problem is that according to the official policy of the ECB, on September 2018 it is expected to end its huge bond purchase program that took place in the last three years. Do you think there is anyone interested in buying German government bonds with a yield to maturity of zero percent? And who is willing to buy bonds of Italy, Spain or Greece at a low single-digit interest rate, which is likely not to be fully repaid? You guessed it right – there will be no buyers for these government bonds and certainly not for corporate bonds in Europe. This means that European countries and companies will not be able to issue new debt or that they will have to issue it at much higher interest rates. A sharp rise in bond yields in Europe, especially since a large number of countries, companies, and financial institutions have not yet reached normal activity, is a significant risk to the financial stability of the eurozone. This is indeed a scary situation. So are we headed to a market collapse? If the scenario I have just described regarding the rise in bond yields in Europe will materialize, this could lead to sharp declines in the stock market. However, most chances that Mario Draghi, the president of the European Central Bank, will not let this happen during his term of office. He will extend the monetary program in Europe. The same thing will probably happen in Japanese and China – their central banks and governments will continue injecting massive amounts of money for as long as necessary to prevent the collapse. These problems will eventually explode, but the explosion could be delayed for years. However, shares traded at multiples too high should still cool down to a more reasonable level in the near future. Thus, if you hold non-profitable growth stocks based on high leverage (Tesla Motors is a good example of such a company), I would consider reducing positions. You’ve probably made a lot of money from these investments in recent years, but my feeling is that the party there is over (but I would not short these stocks like Einhorn did). In our portfolio, there are no such shares, so there is no reason to make any change. On the contrary, the logic is to take advantage of possible declines in the market in order to buy more of the attractive shares we hold. Recently, a number of stock spin-offs have been started trading, which I am examining for our portfolio (for example, Colony NorthStar Credit Real Estate). Especially during a period like today, I carefully examining the profitability of companies, their ability to service their debts and I place particular emphasis on the valuation side to ensure buying at Margin of Safety large enough. Fortunately, if you follow my recommendations, you should have at least 15%-20% of your portfolio in cash, which will make it possible to buy new attractive shares in the near future. Of course, I’ll keep you posted on any stock that I buy to the Long Run Portfolio. Be the first to comment on "Increase in market risk level? Is it time to sell stocks?"